Citrus Catering & Events: The Foodie Blog: What's for Dinner? Since the theme of my Friday posts are "What's for dinner"... I figured I would share just that. 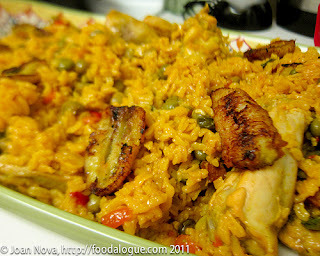 Tonight's dinner plan is one of my childhood favs, Puerto Rican Arroz con Pollo (chicken with rice). I picked up some chicken legs the other day (since they were on sale at Kroger) with this dish in mind. I've experimented with this fav a ton, I've made it in the traditional one-pot fashion, I've tried half rice cooker/half stove top, I've added pigeon peas (yum), I've tried a more Spanish style and cooked it in the oven... like I said, I've experimented a ton and it has all be delicious. Make recaito in blender (about 1 cup cilantro, 1/2 dozen culantro leaves, 1/2 bell pepper, 2 cloves garlic, 1/2 onion, 1/3 cup of olive oil, 1/4 tsp dry seasoning.). Butcher chicken and season with 1/2 packet of Sazón. Put a few tablespoons olive oil in heavy pot (like dutch oven) and add a few tablespoons of recaíto. Add 2 cloves garlic minced, other half of onion and pepper (minced) and saute. Add chorizo and tomato sauce. Add chicken pieces and cook for a few minutes till external rawness disappears. Add wine, olives and capers. Bring to a boil and cook for a few minutes longer to evaporate alcohol. Add rice, mix well to coat the grains and cook for a couple minutes. Add broth and 1-1/2 packets of Sazón with culantro + achiote. Bring to full boil and continue cooking for about 5-10 minutes until you start to see some of the rice rising to the surface. At this point, lower heat and cover pot. Add cooked pigeon peas, remaining culantro (chopped or whole), cover again and let sit. • Finish with drizzle of olive oil and a few fried guineos (baby sweet plantains). 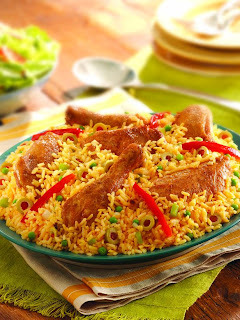 • Sazon with culantro + achiote replaces Spanish saffron for coloring and flavoring rice. Truth be told, I'm no good at following recipes verbatim, so I'm sure I'll add a little of this and take out a little of that, but this seems to be a fantastic place to start. I'll be sure to record my process and share the details with you all next week. I'm hungry already just thinking about it! Enjoy your weekend! See you back here on Monday for, "Monday's with Michelle". P.S. In case you aren't following me on twitter and didn't see my recent tweet, the Candler park Fall Festival is this weekend, make sure you check it out! I love food and this one look so delicious. Keep posting! This past weekend we had my sister's Baby Shower catered by New Orleans Bar and Grill. They were friendly, fast, efficient, and provided excellent customer service. Midweek Eats: Healthier Arroz con Pollo?? What's for dinner: Don't eat me! Midweek eats: Spice up your life!